January 22, 2015 Robert A. Weigand, Ph.D. This article will review NetFlix from a fundamental and technical perspective. Investors liked NetFlix’s results from Q4 2014, focusing on the company’s ability to grow the global subscriber base. The stock had a big move after hours Wednesday, trading above $400 for the first time since October. Although it continues trading like a nineties dot-com darling, NetFlix’s stock remains considerably overvalued vs. any reasonable future growth and profitability assumptions the company may achieve. 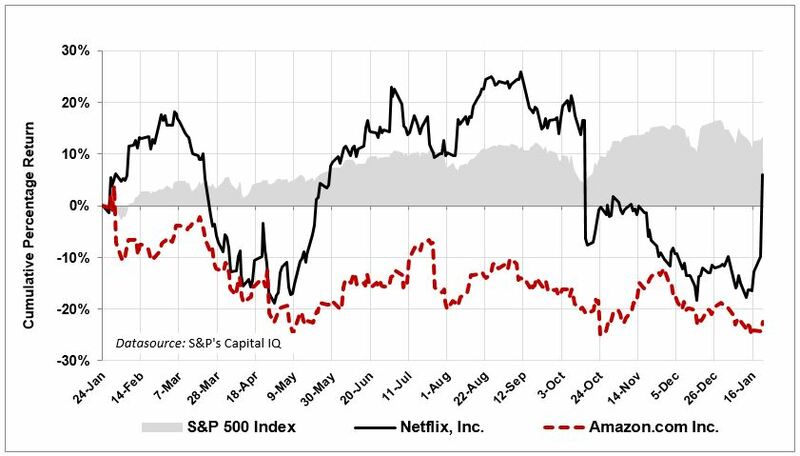 Below we see that NetFlix (compared with the S&P 500 and Amazon) has alternated between beating and lagging the S&P 500 for the past 12 months. Yesterday’s sharp price spike stands out in the chart. NetFlix’s deteriorating profitability is shown from various perspectives in the following table. Operating margins have collapsed into the low single digits, free cash flow margin is negative, and 2013 profits are lower than 2009-2011. 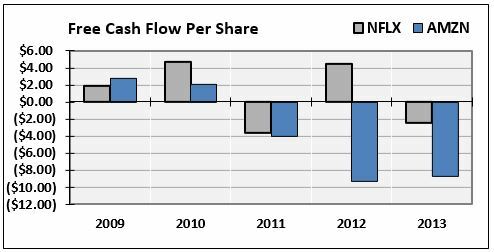 NetFlix’s negative free cash flow per share (shown below) is similar to the long-term deterioration displayed by Amazon. At least Amazon has been on a CAPEX spending spree, which eats up their free cash flow. 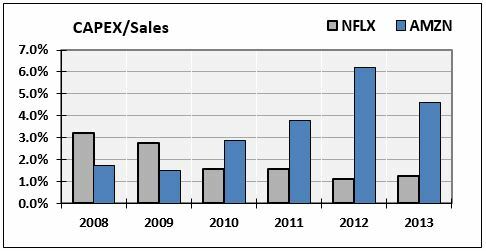 NetFlix has yet to make a big move in CAPEX spending compared with Amazon (see below). Both stocks also struggle to create economic profit. I projected NetFlix’s financial statements using generous modeling assumptions. 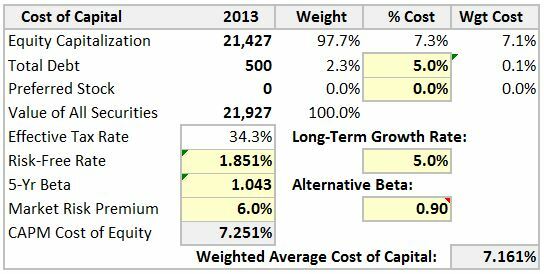 I grew future revenues 22% for 2014, tapering down to a long-term growth rate of 5.0% in perpetuity (that is an exceptionally high growth rate for valuation modeling). Even though profit margins have been contracting, I set NetFlix’s pro forma operating margin at 9% and their net margin at 7%, much higher than the company has achieved in recent years. NetFlix’s cost of capital calculation is shown below, containing several more generous assumptions, including using the current 10-year yield (only 1.85%), and lowering their beta from a historical 1.04 to 0.90. 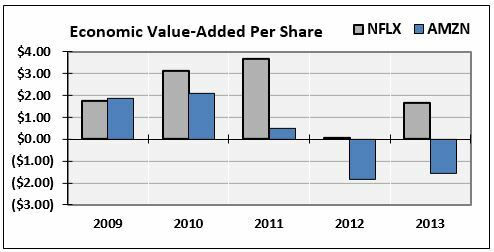 NetFlix’s discount rate of 7.161% is extremely low, which benefits their discounted free cash flow (DCF) valuation. The discounted free cash flow model is shown below. Even with the generous modeling assumptions (continued fast growth, profit margin expansion and lower risk), the best DCF value I can obtain for NetFlix is $336, vs. their recent price of $409 after hours on Wednesday. The stock remains overvalued by at least 17% ($73 per share), based on a best-case scenario estimate. 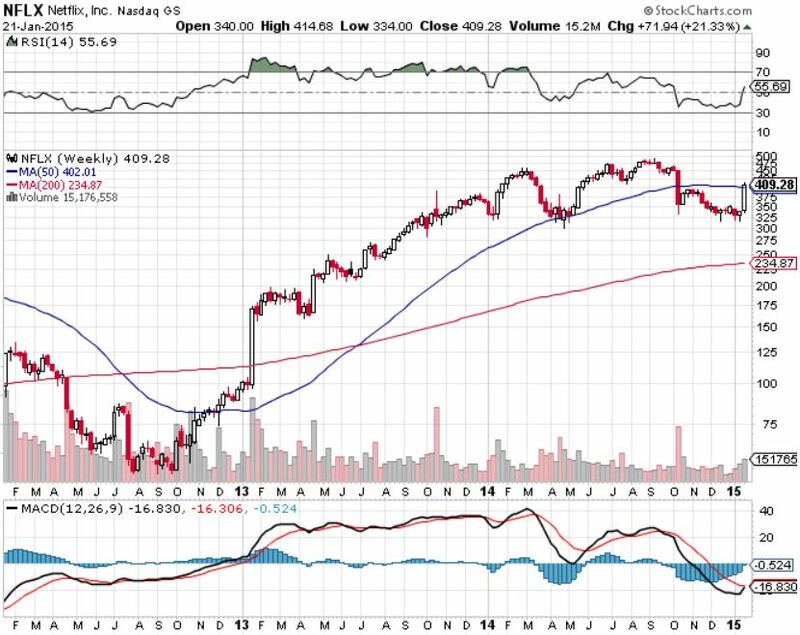 A long-term (weekly prices) technical chart of NetFlix shows that yesterday’s closing price of $409 puts the stock right at its 50-week moving average. Although the MACD is still indicating negative price momentum, this breakout above the 50-week moving average could signal the start of a new long-term uptrend. The Wall Street Journal’s Moneybeat blog is already predicting that the next stop for this stock is $500 a share, which is possible (especially with a little help from the ECB, and occasional QE4 hints from Jim (The Mouthpiece) Bullard). Other brokerages, including Stifel, have also set a new price target of $500 for the stock. Conclusions: NetFlix continues to find a way to grow the subscriber base, which is certainly good news. But the stock price of $409 reflects unrealistic growth and profitability targets the company is unlikely to achieve. If you’re a technical trader, or looking to fill a spot in a growth/momentum portfolio, NetFlix may fit the bill. But if you’re a fundamental investor, the stock is significantly overvalued at $409. The author holds no stock in NetFlix or Amazon. Data from S&P’s Capital IQ.